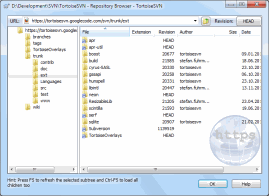 TortoiseSVN 1.7 is a superset of all previous TortoiseSVN releases, and is considered the current stable and "best" release. Anything in earlier versions is also in 1.7, but 1.7 contains features and bugfixes not present in any earlier release. TortoiseSVN 1.7 dropped support for Windows 2000. It requires at least Windows XP with service pack 3 to work. If you're still using Windows 2000 or Windows XP without service pack 3, you either have to upgrade your OS or keep using TortoiseSVN 1.6. This page describes only major changes. For a complete list of changes, you can check our commit logs. Subversion 1.7 features a complete re-write of the working copy metadata management system of Subversion, code named WC-NG. You can find out more about this new format in the Subversion 1.7 release notes. A key feature of the changes introduced in Subversion 1.7 is the centralization of working copy metadata storage into a single location. Instead of a .svn directory in every directory in the working copy, Subversion 1.7 working copies have just one .svn directory — in the root of the working copy. This directory includes (among other things) an SQLite-backed database which contains all of the metadata Subversion needs for that working copy. Even though the data is stored in a structured format, the relationships between the data are complex. We highly discourage external tools from modifying the data held in this database, as such modification is likely to result in working copy corruption. Subversion 1.7 introduces substantial changes to the working copy format. In previous releases, Subversion would automatically update the working copy to the new format when a write operation was performed. Subversion 1.7, however, will make this a manual step. Before you can use an existing working copy with TortoiseSVN 1.7, you have to upgrade the format first. If you right-click on an old working copy, TortoiseSVN only shows you one command in the context menu: Upgrade working copy. To be on the safe side, you should run a cleanup with your pre-1.7 SVN client on all your working copies, because if the working copy is in an inconsistent state the upgrade process might fail. Best to run cleanup before installing the new version of TortoiseSVN. Even after cleanup the upgrade process does not always run as smoothly as it should, and it can be quite slow. We recommend that you commit all changes to your working copy (using your pre-1.7 client) before upgrading. If the upgrade fails for any reason, just make a fresh checkout. Once you've upgraded your working copies, older SVN clients won't be able to access those working copies. 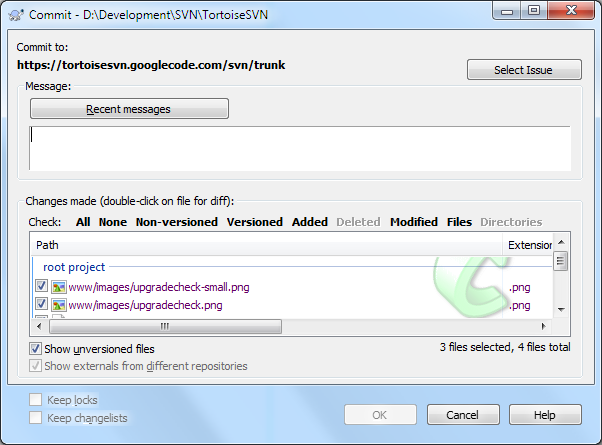 So make sure that you update all your SVN clients (in case you use not just TortoiseSVN). 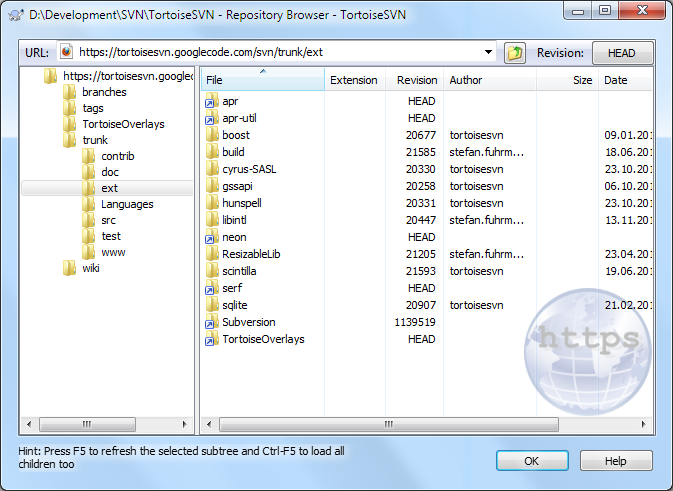 For your convenience TortoiseSVN includes a copy of the 1.7 SVN command line client in the TortoiseSVN/bin directory. In previous releases, users who installed TortoiseSVN on an x64 OS also had to separately install the 32-bit version of TortoiseSVN to get its features for 32-bit applications too. TortoiseSVN 1.7 includes the required 32-bit parts in its x64 installers. There's no need to install the 32-bit version of TortoiseSVN on x64 OS. 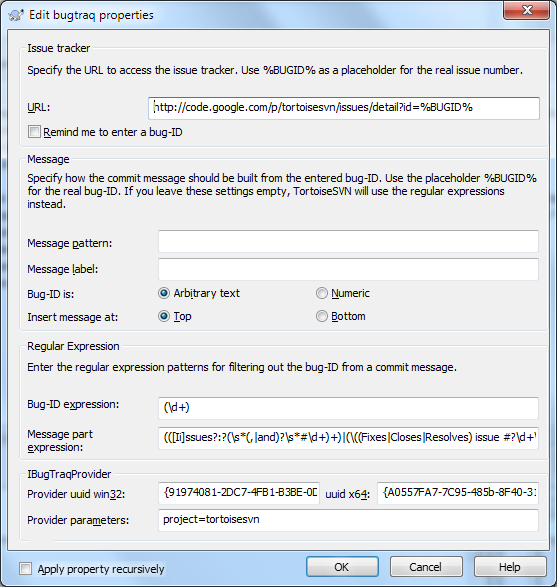 Handling SVN properties is now much easier. Most of the properties you want or need to set on your working copies can now be set and modified without knowing the exact format. TortoiseSVN 1.7 provides custom dialogs for most of the known properties. 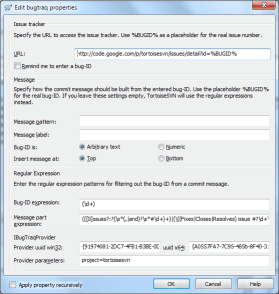 The above screenshots show the new property dialogs for the svn:externals and all the bugtraq: properties. There are more custom property dialogs available in TortoiseSVN 1.7. Please have a look at the docs to find out about all of them. The explorer in Windows 7 introduced libraries, which are containers for files and folders that have something in common. TortoiseSVN 1.7 creates a new library type for SVN working copies. If you put the root folder of your working copies in that new library folder, you get four buttons at the top of the explorer which execute the most used commands: Commit, Update, Check for modifications and Show log. This saves you from using the right-click context menu for these often used commands and really saves a lot of mouse clicks. The log dialog doesn't look much different. But in its core it gained a lot of changes. Most noticable may be the increase in performance. Showing and filtering hundred thousand entries is now done almost instantly. Filtering also has improved a lot. Especially the syntax now resembles more what users are used to from web search engines. For example, filtering for Alice Bob -Eve will show strings containing both Alice and Bob but not Eve. For more detailed examples, please refer to the docs. 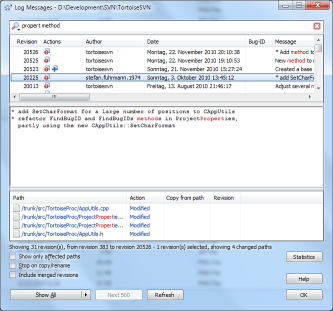 Another feature the log dialog has is that it highlights filter matches in red. That way it's much easier to find out which part of a log entry matched the filter string. 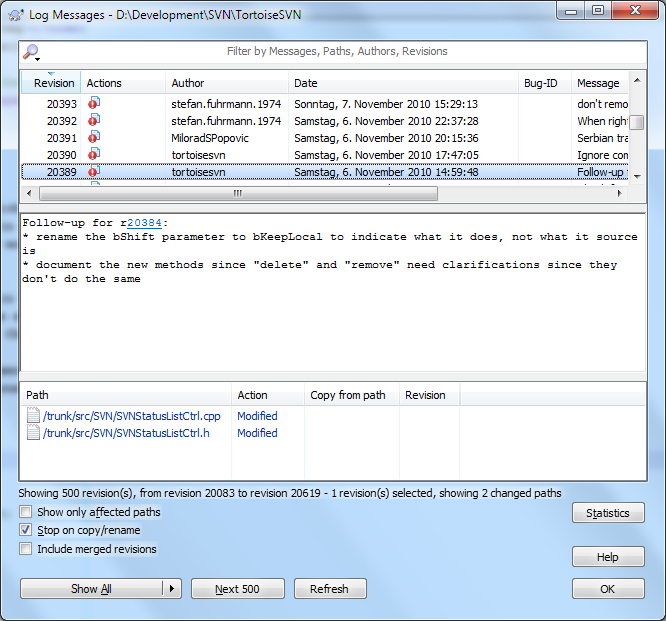 If revisions are mentioned in a log message, then the log dialog turns those into links. 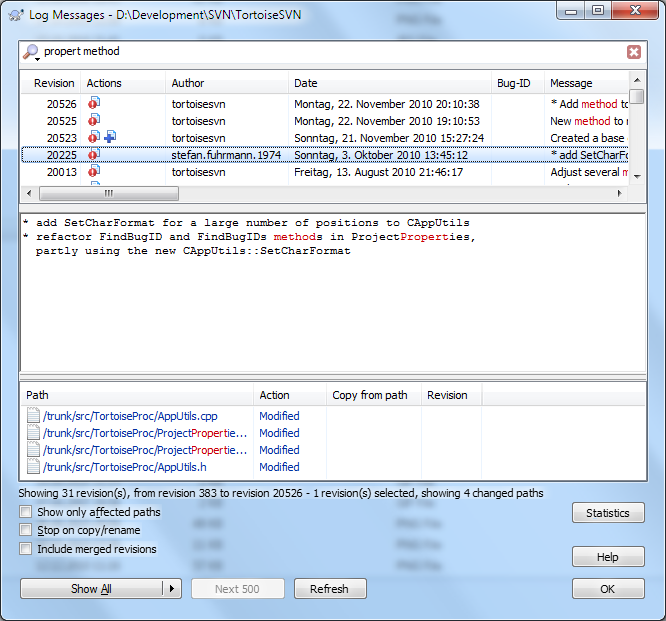 Clicking on those links will automatically select the mentioned revision in the log dialog. The revision graph also got a lot of improvements. Escpecially the startup time has been reduced a lot, which will be most noticable for very big repositories. Since revision graphs can get very big, saving them as bitmap images can lead to very big images. While it was possible to save the graph as a wmf file, that format can only be used on Windows. And of course, you can't show it in a web browser. The revision graph in version 1.7 can save the graph in the SVG format. Most web browsers can show that format natively, and even Internet Explorer in its latest version is able to show those files directly. If your browser supports this format, you can have a look at the TortoiseSVN revision graph following this link. 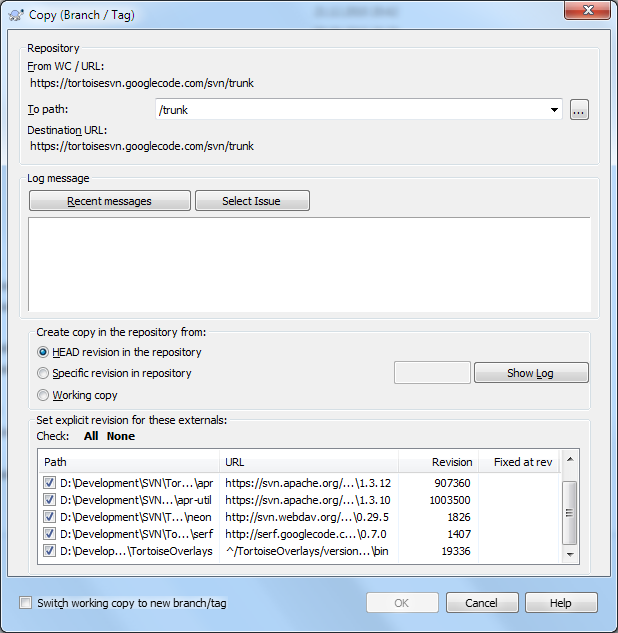 When creating a branch or tag, the svn:externals properties are branched/tagged as they are, usually pointing to the HEAD revision of another repository or even the same repository but different path. If the svn:externals are not tagged too, a later checkout from the created tag would fetch the HEAD revision of the external, which can lead to inconsistent builds if the external got additional commits. The branch/tag dialog now allows you to tag the externals too. 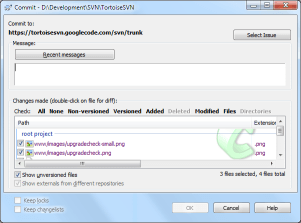 If externals are set to an explicit revision when creating a branch or tag, TortoiseSVN automatically changes the svn:externals property. When the branch/tag is created from HEAD or a specific revision in the repository, TortoiseSVN first creates the branch/tag, then adjusts the properties. This will create additional commits for each property. When the branch/tag is created from the working copy, the properties are modified first, then the branch/tag is created and then the properties are changed back to their original value. The commit dialog got a few UI changes as well. The first thing you'll notice are the new link labels just above the list with the items to commit. These links are used to check or uncheck specific items. With those link labels, that task is much easier to accomplish than with the checkboxes that were used in earlier versions. The commit dialog now also shows a notification if there are updates for TortoiseSVN available, i.e., if you don't have the latest version installed. This replaces the separate dialog that popped up in previous versions since many users got annoyed by that pop up dialog. The repository browser shows folders that are included with the svn:externals property. It's also possible to browse to those folders, even if they are located in different repositories. 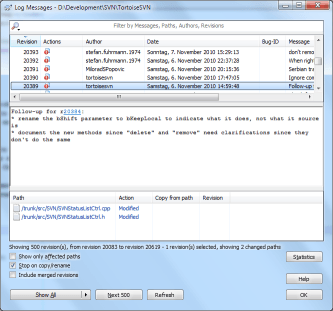 The external folders are marked with a red arrow to distinguish them from normal folders in the repository. It's now also possible to edit a file directly from the repository browser. This makes it easy to make quick changes to a file without having to check out a whole working copy. Starting up the repository browser and browsing itself also got a lot faster in 1.7 due to heavy caching and pre-fetching information in the background. If you only need a working copy that has only a few folders of the project, you have to do a so called sparse checkout. In previous versions this was done in multiple steps by first checking out the parent folder with depth empty, then updating the folders you want one by one with the required depth. Now this is much easier: in the checkout dialog there's a button choose items... which opens a new dialog where you can easily check the folders and files you want and uncheck those you do not need. After everything is selected, the checkout will take care of the rest and you'll end up with the sparse working copy you want - all in one easy step. Sections which do not contain any differences can be hidden so that only the changes are visible. This helps to get a better overview of the changes without too much scrolling. overly long lines are hard to view since they require a lot of sideways scrolling. A new option allows to split those lines into multiple lines when viewing so no side-scrolling is necessary anymore. a doubleclick on a word/variable/statement/... marks that word throughout the whole document. And the view bar on the left also indicates where the same word/variable/statement in the document can be found. This allows for a much easier review of changes. Subversion working copies are sometimes accessed using several different clients, e.g. TortoiseSVN, AnkhSVN, and the SVN command line client. Because the working copy format has changed with this release, 1.7 clients cannot access an earlier working copy without first upgrading it. Pre-1.7 clients cannot access 1.7 working copies at all and there is no downgrade option. Migrating to 1.7 working copies must be considered a one-way operation. If you need to use multiple clients on the same working copy then be sure that you can update all the clients before upgrading the working copy. Older clients and servers interoperate transparently with 1.7 servers and clients. That is to say, you can use a 1.7 client with an older server, and you can use a 1.7 server with older clients. However, some of the new 1.7 features may not be available unless both client and server are the latest version. There are also cases where a new feature will work but will run less efficiently if the client is new and the server old. HTTPv2 1.7 1.7 any Permutations of older client/server combinations will continue to function at the pre-1.7 feature level. WC-NG 1.7 any any 1.6 working copies cannot be used with 1.7 and will not be upgraded to the new 1.7 format automatically. 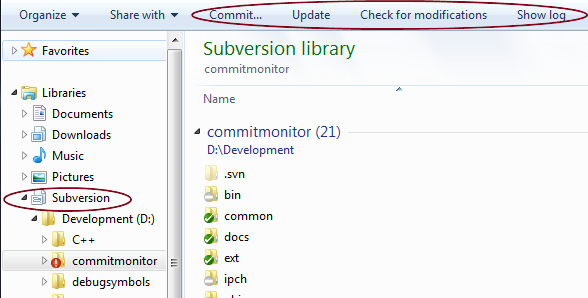 1Reminder: when using the file:// repository access method, the Subversion program is both the client and the server.